JL Boston Teams Up with ArtLifting to Increase Homelessness Awareness - The Junior League of Boston, Inc.
As we begin another cold winter here in Boston, many of us will take for granted the warm homes we return to each night, but not everyone in our community is so lucky; there are approximately 4,000 homeless youth in the Boston public school system alone. Our ten community mentoring programs for girls are part of an important support network for families struggling to put food on the table and to provide adequate shelter. In a bid to further our impact on the local homeless community, JL Boston teamed up with ArtLifting, a social enterprise and benefit corporation that empower artists living with homelessness or disabilities through the celebration and sale of their artwork. 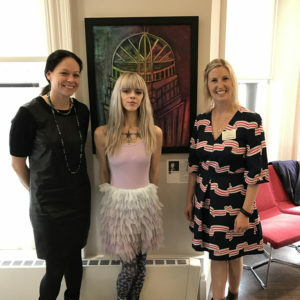 The organization loaned JL Boston a selection of paintings by Boston area female artists for an exhibit designed to raise awareness around issues faced by the homeless in our city. Founded by Liz and Spencer Powers in 2013, ArtLifting offer artists the chance to secure their own income through the sale of original paintings, prints and products. By showcasing and selling artwork their artists gain self-confidence that permeates all aspects of their lives. “By engaging with organizations like ArtLifting, to educate our members and the public on the issue of homelessness, we will inspire new solutions to support families and individuals facing this crisis,” said Karen Page, president-elect of JL Boston. The exhibit, on display at the JL Boston Headquarters from November 11 to December 2, culminated in a Meet the Artist Luncheon with featured artist Kitty Zen, who shared the stories that inspire her beautiful work. “Remembering the bitter cold nights and blizzards of early 2015, JL Boston continues to collaborate with local organizations around the common purpose to bring homelessness awareness. It was an honor to host the ArtLifting exhibit and luncheon with Kitty Zen, featuring inspiring artwork by local women affected by homelessness,” said Pamela Lynch, president of JL Boston. To learn more about ArtLifting and view artwork for sale, please visit their website.